Don't panic. When we say "physics," we're not necessarily talking about the science concerned with the study of matter. But we are talking about a form of science that's going to impress anyone that gets a thrill behind the wheel. 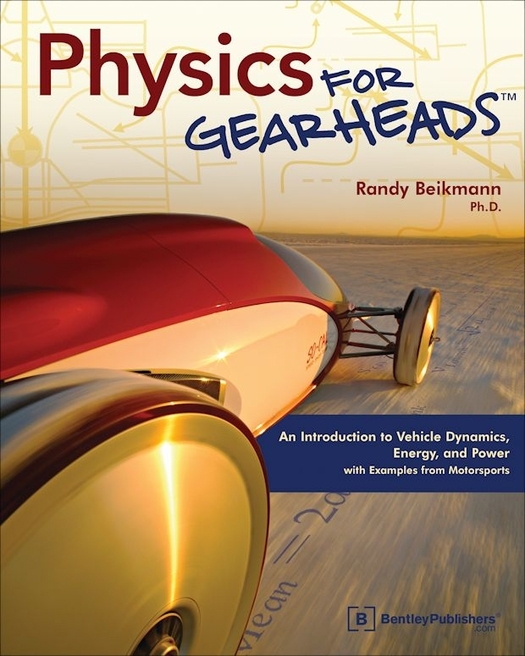 Physics for Gearheads offers everyone the opportunity to explore motorsports engineering and simplify it. The book aligns the laws of physics with how your engine functions, convincingly offering proof that the more you know about how your car works the more you know about physics. 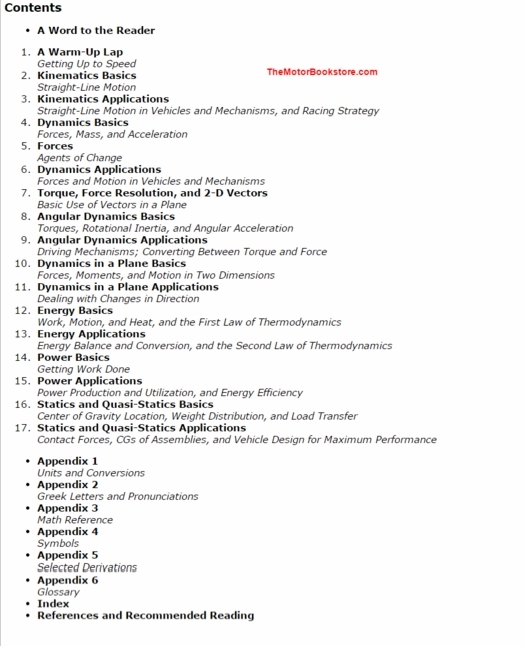 The class begins with the fundamentals, a primer on basic physics principles in conjunction with the energy, power and dynamics of a vehicle, leaning specifically on engineering in motorsports for examples. This makes perfect sense as motorsports is a field steeped in development that results in maximized power for competition. This is an industry that never ceases to find ways to surpass itself utilizing innovative solutions, often relying on skill and determination to reinvent what already exists with smart tinkering. At the end of the day, even if they're not aware of it, both the enthusiast and the professional team member are looking at ways to improve their engines, transmissions and telemetry through the application of physics. Physics for Gearheads goes on to break down theories that apply to motorsports engineering that even a seasoned driver or mechanic is using but not fully conscious of, such as kinematics. This concerns the motion of points in relations to objects and groups of objects. 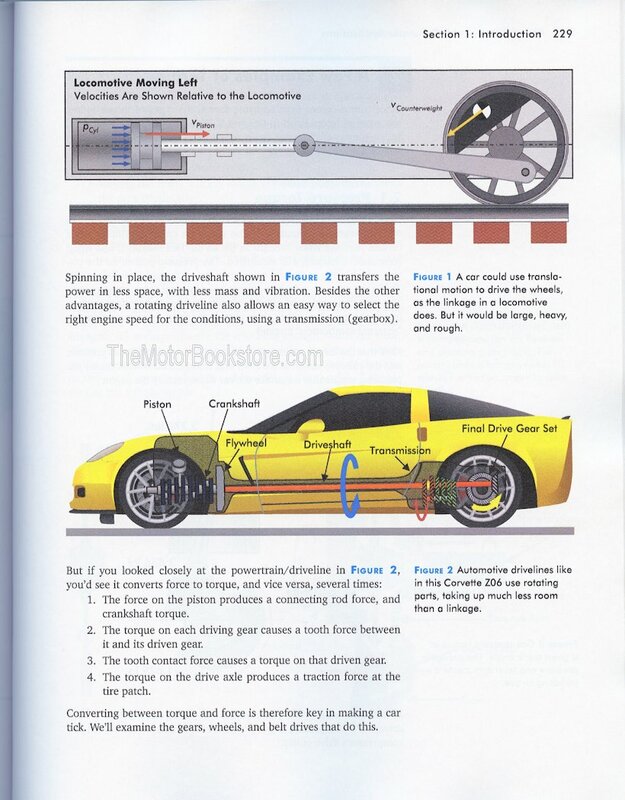 This directly relates to straight-line motion used in vehicles, mechanisms and racing strategies. The book proceeds to build on its premise, tackling subject matter like the basics of mass, forces and acceleration. Using language as simple as it gets in a book that's basically about science, you're going to be surprised how much you know about physics simply by getting under the hood. Your lessons continue: diagrams explain how lateral acceleration needs a roll angle to create a steady, yet safe, curve; what rear tires do to produce traction force; and how kinetic energy plays its part in racing. If you're into motorsports engineering, you're already a student of physics. Physics for Gearheads gives everyone the opportunity to own that. From energy and power applications to statics and quasi-statics, this is a book that loves science, cars and power, and wants every driver and mechanic to know why they should do the same. 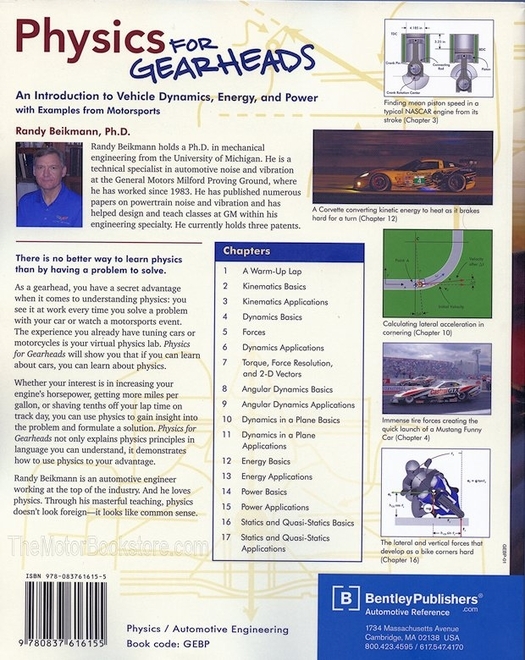 Below: Physics For Gearheads Sample Page - GEBP. Copyright Bentley Publishers. Ask a question about Physics for Gearheads. i havent gotten into the book yet, but from the table of contents i realized that it is exactly what i was looking for. Perfect condition too!